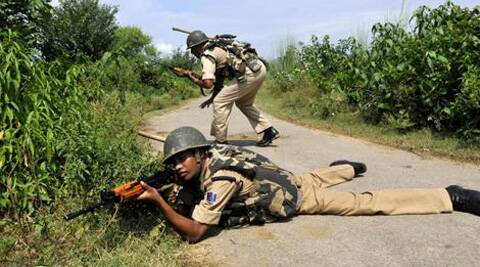 Three heavily armed terrorists had on Friday killed three people including an army soldier. Sources said the suspects were first spotted by some locals at a local temple. Four days after security forces killed three fidayeens during a day-long encounter in Janglote area along the Jammu-Pathankote national highway, Jammu Kashmir Police and security forces launched joint searches for two suspected terrorists in nearby Ghatti area of Kathua district today. The searches followed inputs from a local that he had seen two suspects at a local temple in the morning. Since then, the searches have been going on in the area, but no suspect has been found so far, said Kathua Superindent of Police Mohan Lal. Since Friday last, this has been the second time that police and security forces have launched searches for suspects following information from locals in different areas in the area. Earlier, they were informed by a local driver about the sighting of two suspects at a tube well in Dinga Amb area, but the inputs later turned out to be hoax, SP said. Three heavily armed terrorists had on Friday killed three people including an army soldier in twin attacks at Dayalachak and an army camp in Janglote area along the national highway. In a day long encounter with security forces, all the three terrorists were killed and huge quantity of arms and ammunition seized from them. Since then, both police and security forces have been maintaining highest alert across the state as there have already been reports about terrorists planning to disrupt Lok Sabha elections which are beginning in phases from April 10. Kathua, which falls in Udhampur parliamentary constituency, is going to polls during the second phase on April 17.